R. and I stopped by Loving Hut Saturday night for a quick dinner on our way from the airport to the south side area. Actually, I was the one who needed a some solid food in my stomach in preparation for some St. Paddy's Day alcohol consumption. Anyway, Loving Hut is a vegan restaurant that just opened in December and had been on my wish list for a little while. What I didn't realize until recently is that it is actually an international chain, with locations in Brazil, Hong Kong, Australia, Spain, Mongolia, and many other countries, just to give you a sense of its global reach. What's interesting, however, is that every restaurant has its own unique menu. Just for fun (and because I didn't quite buy the "unique menu" spiel at first), I checked out the menus at their Palo Alto location, their Russia location, one of the Toronto locations, and two of the locations in Hong Kong. And I can verify that the menus are indeed completely different - yes, even the two in Hong Kong are different from one another. So, while Loving Hut is run by an international group, I don't think of it as a chain at all. I had heard good things about the Loving Hut Special Rolls from the Binge! Eating in Pittsburgh blog so I had to try it. And I'd have to agree with Jake who authors the Binge! blog. 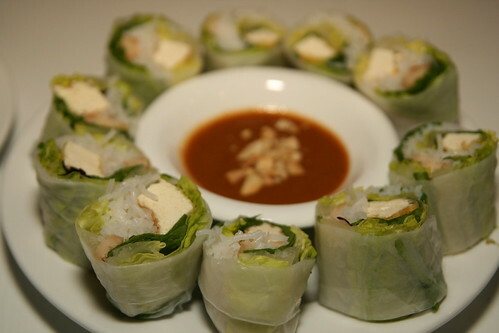 These rolls, made with vermicelli, mint, and tofu with a soybean, pineapple, and peanut dipping sauce, were really well done. I tend to think that one important aspect of a good roll is the texture. These rolls have a nice, creative combination of flavors with the right amount of crunchiness. Everything tasted fresh. As for my main dish, I was going to order something else until I spotted the Guru Curry on the specials menu, which came with a choice of soy protein, potatoes, or taro. Taro?! YES, PLEASE! But when I placed my order, the waitress informed me that they did not have taro. I was probably a little more visibly and vocally disappointed than I meant to be - well, taro was the only reason I wanted the Guru Curry after all - but guess what? The waitress said she'd check with the kitchen and - surprise, surprise! - taro magically appeared. OK, I don't mean to be cynical, but anytime a restaurant tells me they're out of something, I tend to be a bit skeptical (maybe it's because I've read this recently - see #4). They ended up putting both taro and potatoes into the Guru Curry for me. I have a feeling they gave me 1/2 taro and 1/2 potatoes rather than a full serving of each, but whatever, I didn't question it. I was hungry! 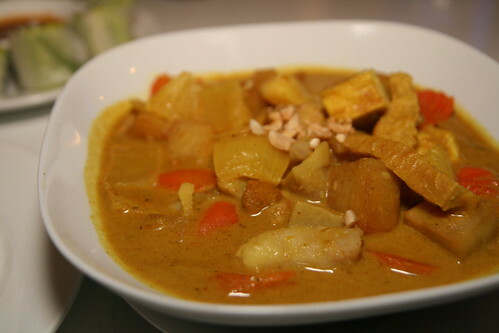 The Guru Curry did make up for its limited taro with its tastiness. R., who didn't order anything for himself but nibbled at my food (that's OK, I gave him permission), said he thought the special rolls were great until he tried the Guru Curry. He couldn't stop eating it! As a side note, the Palo Alto location also serves an item called the Guru Curry, but it costs $1 less and is made with a different combination of ingredients. Random: I know I've been writing a lot more than I mean to lately. Now that work has picked up again, and with many upcoming dining out opportunities, I may have to scale back on the amount of text I write in each post and put the focus back on the photos, like I originally intended. Thanks for reading!